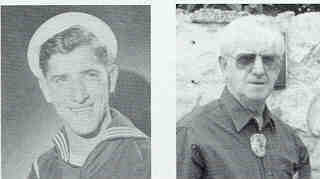 Nicholas M. Aiello, Seaman 1/c, born Feb. 18, 1927, Chicago, IL, graduated high school and joined the USNR Feb. 18, 1944. In March 1944 he took a long train ride from Chicago to Farragut NAS, ID, to basic training for five weeks. Returned to IDaho and was put into OGU. After two days , he was on a muster list for the USS West Virginia. They picked her up at the Navy Yard in Bremerton, WA and he was placed in the 4th Div. Main Btry. They shook down in Puget Sound and down the West Coast to California. They left the coast on their way to Pearl Harbor and after two days in Pearl, they left for the Pacific. They bombarded shore emplacements at Leyte, met the Japanese fleet at Surigao, went on to Luzon, Iwo Jima and Okinawa. The Atomic bomb put an end to the shooting war. On Sept. 2, 1945, the West Virginia was in the bay with the Mighty Mo for the formal surrender of Japan. He will remember that always. Discharged June 2, 1946, with the rank of S1/c. His awards include the American Defense and the Asiatic-Pacific w/4 stars. He and his wife Evelyn (married 50 years on Sept. 21, 1996) have two sons, one daughter and eight grandchildren. He worked for Lakeside Cent. Co. for 35 years and K Mart for 15 years. He is an avid football fan, enjoys traveling and gambling in Vegas. He lives in Albuquerque, NM.